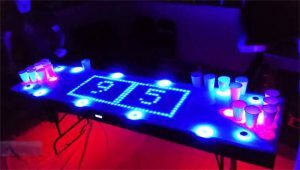 Beer pong, the classic beer drinking game that has been played since the dawn of time. Legend has it, a caveman named Gorak bet his buddy Steve that if he could throw a ball of petrified mammoth crap into his glass, Steve would have to drink it with the turd inside. Gorak made the shot and just like that, beer pong was invented. The concept is simple, throw a ping pong ball in your opponent’s cup and he has to drink it. Of course the game gets harder and harder as you gradually get drunker and eventually it gets hard to focus.